Thousands Of Kids A Year Migrate To The US Alone. What Happens Next? The U.S. lost track of nearly 1,500 migrant children last year. Refugee. Migrant. Asylum-seeker. Unaccompanied minor. They're technical terms, but what we're really talking about kids 17 or younger, many traveling more than 1,000 miles all alone to escape violence. Some say they're running for their lives. The numbers fluctuate from year to year, but the challenges of management do not. From October 2017 to April 2018, 26,001 unaccompanied minors were apprehended on the U.S.-Mexico border. That marked a 12 percent drop from the previous year, but apprehensions still averaged about 123 a day. Families with children and unaccompanied minors made up 10 percent of illegal border crossings five years ago. Now, they account for 40 percent of those detained. Journey: For starters, most of the children apprehended on the southern border traveled from El Salvador, Guatemala and Honduras, where drug cartels and gangs kill with impunity. Detained: After they turn themselves in or are caught at the border, the kids are held in a U.S. Customs and Border Protection detention facility. 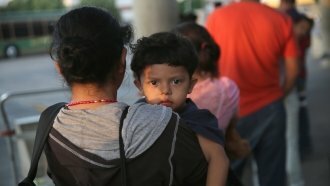 Shelter: Within 72 hours, they are supposed to be moved from detention to one of more than 100 shelters, where they stay for 35 days on average. Also at this point, the children are transferred from the Department of Homeland Security to the care of the Office of Refugee Resettlement, which is part of the Health and Human Services Department. Caseworker: Children are assigned a caseworker at the shelter. They're given medical checkups and food. Sponsor: HHS is solely responsible for children until they can be released to a sponsor. Sponsors, often a relative, are adults who are suitable to look after the child's well-being. All sponsors must pass a background check. Proceedings: The sponsor is supposed to make sure the child is present at immigration proceedings and, if a judge orders deportation, brings them to ICE. About 40 percent of the kids never show up for court hearings, disappearing into the country, the DOJ said in 2016. Monitoring: Until a case is resolved, local or state child protective services are responsible for following up on reports of abuse or neglect once a child is placed with a sponsor. However, since 2016, HHS says it does make follow-up calls within 30 days to ensure that the minors continue to live with sponsors, are enrolled in school and are aware of their court dates. Just look at the news. You'll see the process is far from foolproof, especially at the sponsor stage. Few details: HHS called 7,635 children the department had placed with sponsors. It found that 6,075 were still living with their sponsors, 28 had run away, five had been deported and 52 were living with someone else. The rest were missing. So while the system is crafted to maximize protection, it's still more porous than most lawmakers and immigration officers would like.